Zack Kassian tries to score on Saginaw's Mavric Parks during a regular season game. 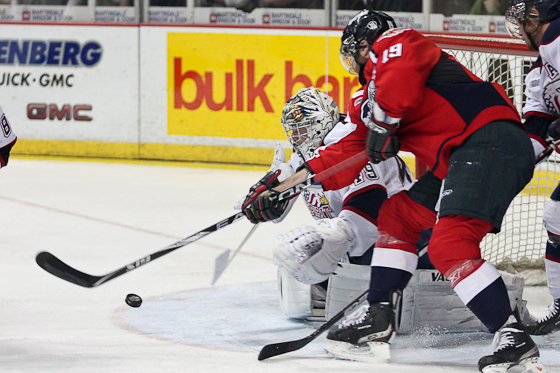 Jack Campbell led the Spits to a 3-0 shutout of Saginaw Spirit at the Dow Event Center in Saginaw Michigan. The first period was scoreless for both sides, but Windsor outplayed and out shot Saginaw 13-5. Kassian and Camera got into a fight within 17 seconds of the opening. Scoring during the second period was from Stephen Johnston who one-timed a pass from Kenny Ryan off the face-off before Nick Ebert also added a power play goal giving the Spits a 2-0 lead going into the final period still out-shooting Saginaw 30-14. Kenny Ryan added another point scoring in the third period assisted by linemates Johnston and Kassian making it 3-0 Spits with just 7 minutes left in the third period. Game 2 is at home on Sunday at the WFCU Center at 2:05 PM.